Indicator dye is Calmagite. This dye changes color depending on pH. pH 9.1-11.4, dye is a blue color. Measure at 610 nm. Start colorimeter plotting program and select the red led (625 nm) and calibrate. Slowly add EDTA titrant. Initally add 50 uL drops, then once absorbance starts to change, add in 10uL steps. After each addition of EDTA click measure. Once absorbance stops changing (absorbance around 0.9 units) stop adding EDTA. Switch off stir plate. 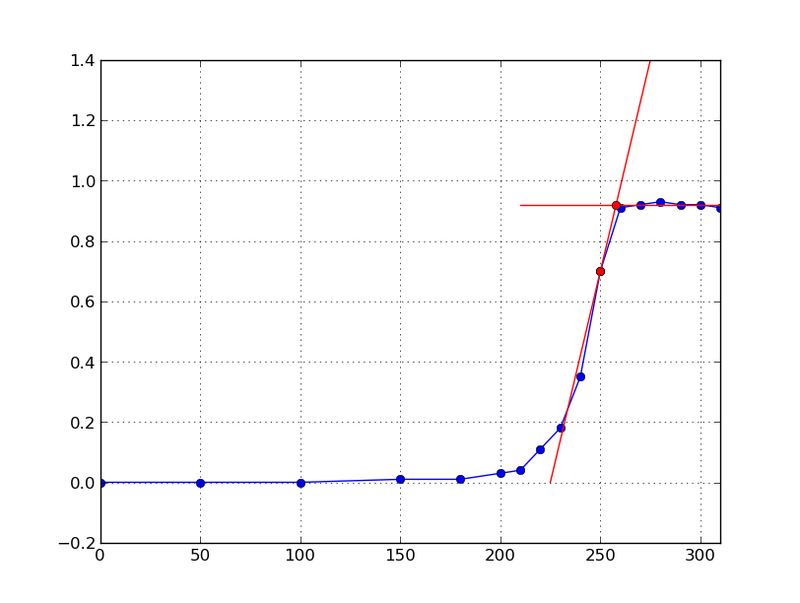 We recently wrote a python program to calculate titration endpoint volume. (Still in early development days). The colorimeter titration program finds the endpoint and corresponding EDTA volume. Below is an example titration with endpoint.